If you don’t ask, you don’t get. What started out as a cheeky tweet turned into a dream come true for Jonny Heneghan. Heneghan challenged retailer Wiggle to take his ageing MG car in exchange for a new Mekk Poggio Ultegra-equipped carbon road bike. So they did. 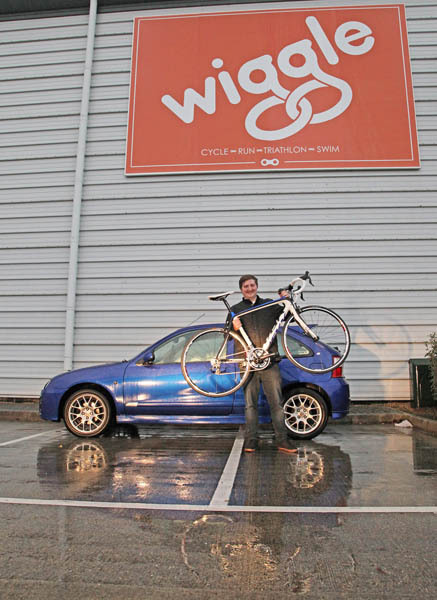 The Manchester man travelled down to Wiggle’s headquarters in Portsmouth at the weekend to make the swap. Heneghan wants to use the bike to commute to work instead of using his old car, but due to saving up for his forthcoming wedding simply didn’t have the spare cash to buy the bike and keep the car. Heneghan saw that someone had managed to get a free holiday via posting a similar message on Facebook, and thought he’d try his luck. 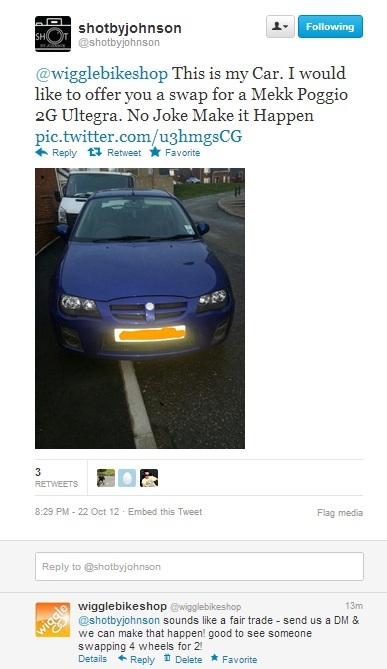 “My fiancé’s Brother and I just thought ‘let’s tweet a bike shop and see if they’re game!’,” said Heneghan. Needless to say, Wiggle have received several other tweets asking for a similar swap, although some individuals have offered the family cat and even their mother-in-law for exchange rather than a rusting banger. “Jonny’s request struck a chord with us here at Wiggle,” said Wiggle’s Social Media Executive, Daniel Loots.